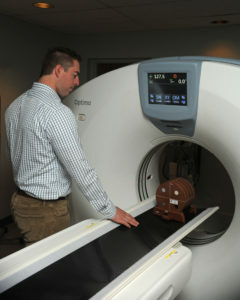 ISS, Inc., offers computed tomography (CT) support , such as shielding requirements, initial CT inspections and determining if the equipment is showing any deficiencies prior to your acceptance from the vendor. We are highly qualified in performing CT equipment surveys. working with service engineers the ISS, Inc., staff has experience with CT system being used in facilities today. The ISS, Inc., physics consulting team can perform calculations for shielding requirements for CT scanner rooms as required by state regulatory agencies. Initial equipment inspections are based on ACR accreditation requirements. Any equipment deficiencies which are discovered during the initial equipment survey must be corrected before patient images are made. The equipment must function according to the manufacturer’s specifications before you accept it. Physicist surveys of CT systems are required every 12 months by most state radiation safety regulations. When a malfunction is reported it must be corrected. Our average report turnaround time is 2 days. You will have the information you need to take corrective action in a timely way. Our medical physics consulting team provides assistance in completing the application for ACR accreditation. This includes help scanning the CT phantom, completion of the data forms, and dose measurements required by ACR for accreditation. “I really like solving unusual imaging problems and helping people people with regulatory compliance issues.” – Jon Erickson, founder, ISS, Inc.